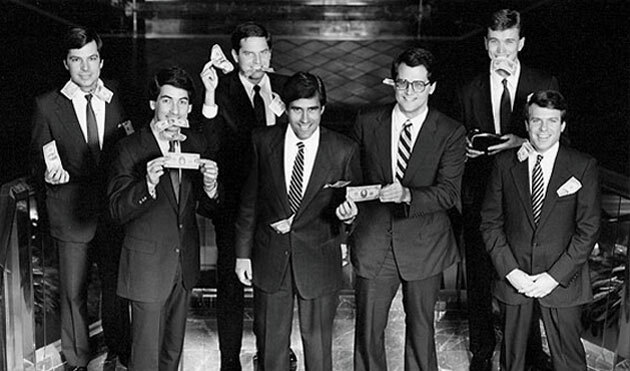 Mitt Romney (center) poses with colleagues from the private equity firm Bain Capital. Mitt Romney, as all the world knows, made his fortune heading up a private equity firm called Bain Capital. As a result, he pays low, low income tax rates. “Probably closer to 15 percent than anything,” he told reporters on Tuesday. That’s a pretty sweet deal, but it’s all perfectly legal. Most of Romney’s income comes in the form of capital gains and carried interest, which have been taxed at 15 percent ever since the Bush tax cuts went into effect a decade ago. So it’s a good time to get a little wonky and ask why capital gains and carried interest are taxed at only 15 percent, while ordinary labor income is taxed at rates as high as 35 percent. If you’re the cynical sort, you think the answer is simple: Rich people make lots of their money via capital gains and carried interest, and the Republican Party is dedicated to making the lives of rich people easy and prosperous. So they’ve made sure those tax rates are low. Maybe so. But there’s an official, noncynical answer too: Capital gains are profits from investments, and a high level of investment is good for the economy. 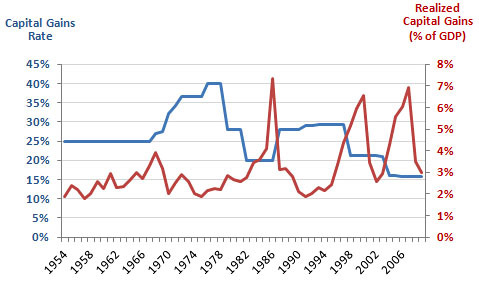 Low tax rates on capital gains encourage investment and therefore benefit the entire economy. So what about carried interest? What’s that all about? Carried interest is a feature of the way partnerships are taxed, and private equity funds are essentially partnerships. In a partnership, it’s frequently the case that one person puts up the money and another person manages the business. Both partners get equity in the enterprise: The former gets ordinary, garden variety equity and the latter gets “sweat equity.” When the enterprise is sold off (hopefully at a profit), both are taxed at capital gains rates. Bain Capital acted as a managing partner in most of its transactions, so this was a pretty good deal for them. After all, most of us who work as managers, even if our pay comes in the form of a bonus that’s based on the profitability of the company, have to pay ordinary income tax rates. That’s because this kind of work is known as “labor.” But if you manage a private equity fund, that exact same kind of work is defined as sweat equity and gets taxed at capital gains rates. This is pretty hard to defend. If it walks like a duck and quacks like a duck, it’s a duck. Except in this one case, where it’s sweat equity. There’s really not much justification for it. So this is where we end up. Mitt Romney pays low tax rates on his capital gains because this is supposed to encourage him to invest his money. But it turns out that it doesn’t. And he pays low tax rates on his carried interest because his job of managing companies that other people own was conveniently redefined as sweat equity and therefore treated as capital gains. It’s a nice deal for the rich, who get nearly all of the benefit of these policies, but neither of them is really defensible. It’s one thing for Mitt Romney to have gotten wealthy running Bain Capital. Good for him. But he ought to pay the same taxes on his earnings as the rest of us.